The battle is on, Serato DJ VS Traktor Pro 2! In this post we look at the best features of both programs to help you decide which one to buy. We find out the pros and cons of both and we also look at the hardware both manufacturers are offering to use in conjunction with their programs. I chose Serato, but which will you choose? You're ready to buy your software but you're torn between these top 2 choices amongst professional DJ's around the world. Maybe you're just starting out as a DJ and you want a set-up with a difference. A set-up that allows you to incorporate traditional turntables or CD decks into your modern digital set-up. Or maybe you've been in the game for many years. But now you're ready to make the step over to the digital world whilst keeping it hands on. Well you've boiled it down to the two best choices and they both have a massive amount of features to offer. We're about to take a look at the standout features of both programs to make the decision easier for you. Serato DJ VS Traktor Pro 2 - Is Serato DJ the best DJ software? Serato has long been the leader in DVS software and is the main choice for many professional DJs. Some DJs argue that Serato has been knocked off the top spot by Traktor since dropping Serato scratch live. Others see progression in hardware development as the main decider. But both have great choices and many compatible products. In that case looking at the programs main standout features should help with your decision. When you first open Serato DJ you're greeted by a very clean uncluttered interface on a dark background. Half of the screen is dedicated to your music library, the other half is your deck section with your waveform information in the centre. This layout is very easy on the eye and wouldn't be at all overwhelming to a beginner DJ. So if you're just starting out this could be a great program to learn and progress with. At the bottom half of the screen you'll find your music library. The library already takes up a big chunk of the screen. But you can click on library mode to shrink the deck section down to give an even bigger view of your library. You'll find this handy when you're scanning for tracks, it just makes it easier and faster to find tracks this way. Here in the library you'll be able to fully analyse each track and make changes including ID3 tag editing. You can access your iTunes library and import your iTunes playlists. You'll also have the ability to browse your tracks and create playlists for DJ sets. The most handy part of the library is the ability to make crates to organise tracks into genre, BPM (beats per minute), key, etc. I find these great for storing scratch sounds, samples, and acapellas. They make it easy to find tracks quickly whilst concentrating on other things. Something very cool is the smart crate that allows you to make large music crates instantly. This is done by creating crate rules. Using your rules, for example - you can create a library crate for tracks under 120 BPM. The crate will then automatically find all tracks in your library under 120 BPM and fill the crate. You'll also see four library panels which can be opened up to display different folders. There is your normal file browser, which is the standard view of your library. You also get a second browser that lets you browse by genre, BPM, artist etc. There's a preparation folder that allows you to drag and drop tracks in preparation for your DJ set. And lastly you have a very handy history folder. Here you can look back at past sets and find tracks that you've previously played. These are listed by the date that you played them and even the time. Once you are ready to select and play a track you can simply drag and drop it from here onto the desired deck above. The Serato DJ interface can display two decks, or four decks depending on your needs. At the top of each deck section you'll find lots of track information. You'll see the song title, artist, key of the track, BPM, track length etc. The white deck overview shows you more useful info about the current track. This includes BPM, pitch percentage, track time elapsed and remaining etc. To the side you'll have your saved cue points. These are certain points of the track that you wish to remember. You can set loops in 4,8,16, or 32 bars. You can then save them so that the loop is still there the next time you play the track. There is a sync button to auto sync your tracks so that they play at the same BPM. This is great for new DJ's or for DJ's that like to have extra time to create loops or playing with FX etc. And the feature called quantize mode will ensure that every beat stays tightly locked and matched. This is a great feature for dropping cue points and exiting loops perfectly on beat. There's a key lock that keeps the same tone whatever the speed of the track. So you can speed it right up and it won't sound like a chipmunks concert is happening in the club! Another handy feature is the beatjump control. This allows you to quickly jump through a track in 2,4,8,16, or 32 beat steps. And all of this can be done while staying perfectly in time with the beat. This is great for skipping large amounts of a track to get to the hook or to skip a long instrumental. This also makes it easier to fit more tracks into your shorter sets. You can also use beatjump with tracks that have a very short intro. If you dont have the time to finish a transition simply click the beatjump control to jump back 32 beats. The mix will stay perfectly in time and you can jump back as many times as you like. This is very similar to looping, but this can be done at the last second with a simple click. Once you finish your mix you won't have to exit the beatjump as it's only activated by clicking the control. The waveform can be put into several different views. Horizontal, vertical, extended (full screen horizontal), or stack view (great for four decks). All of these are very useful but you'll have a favourite that you'll tend to stick to. For those that don't use the sync option beatmatching can be done manually. This can easily be achieved by matching the peaks running along the centre of the waveform. Although you can do it well by eye, using your ears is important to get a quicker and easier match. Or it can be done traditionally using the pitch control on your decks or controller. ABS (absolute mode). This is used to replicate the experience of traditional turntables or CD players. But it uses digital files and control vinyl, or control CD. Using this mode the record behaves exactly like a record, and a CD behaves exactly like a CD. Needles and CD's can even skip just like the old days. It's named absolute as the software is listening for the absolute position of the control vinyl or CD. The downside is that you can't take advantage of cue points or loops etc. REL (relative mode) This brings out all of the features and behaves exactly like a traditional DVS. The software will only be listening to the direction and speed of the control vinyl / CD rather than the absolute position. You'll be able to set loops, cue points, and use FX etc. INT (internal mode). This mode doesn't rely on, or take any notice of control vinyl. All DJing will be done via the interface. This is particularly useful if you have any serious problems with hardware. If you have skipping needles or scratched CD's you can switch over with a simple click. Switching to INT will still allow you to use all of the available features. And lastly THR (Through mode). Using this mode will let you play vinyl records or CD's through your decks rather than control vinyl or CD's. This mode is great for digital DJ's that still enjoy dropping a few regular vinyl or CD's into their sets. And it's also great for those that like to scratch with traditional vinyl or CD's. Serato has worked alongside a long list of manufacturers to offer a range of hardware including mixers and controllers. Some even come bundled with the full Serato DJ software. The Pioneer DJ DDJ-SB2 is built to work perfectly alongside Serato DJ. It's very well priced but you will need to buy the software separately. You can read all about the DDJ-SB2 in my beginners top ten guide > HERE. Or you may want a high end controller that comes bundled with the full Serato DJ software. The Pioneer DDJSR2 controller will be a great choice for those looking for a full package. You can check the current price on Amazon here -> Pioneer DDJSR2. See my professional DJ controller guide > HERE to see which ones come bundled with Serato DJ software. If you're using turntables or CD decks and just need a mixer try the Pioneer DJ DJM-S9 Battle Mixer. It will come with the full Serato DJ software with no further purchase necessary. As we just learned Serato DJ is compatible with a bunch of high end mixers and controllers. But what if you want to use Serato DJ as a DVS using the set-up you already have? If you already have a set-up it's best to buy a plug and play Denon audio interface. The Denon interface package comes with the full Serato DJ and DVS software. You also get the two required control vinyl and two control CD's at a great price. This way you will not require a separate purchase of the Serato DJ or DVS add on. Other options are the Serato approved interfaces from Rane. The Rane sl2 or sl3 interface will get you up and running using simple plug and play technology. Serato updates and support have always been on point and a quick email will usually solve any problems. Serato is packed with features that will fulfil all of your digital DJing needs. The top choice for many pro DJ's, tried, tested, and proven DJ software. Easy to use software with an easy on the eye interface. Great for beginners and experienced DJs. Brilliant customer support and updates. Top performing digital vinyl system, not laggy perfect for DJ's and turtablists alike. Compatible with tons of hardware, with simple plug and play design. Great music library options, smart crates will save you so much time. To use the software you must plug in a piece of hardware or else you'll be limited to one on screen deck. This single con could be the decider in the battle of Serato DJ VS Traktor Pro 2. Not everybody wants hardware so this could put some people off. 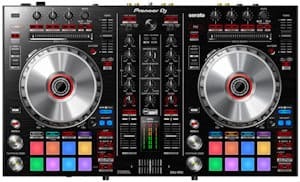 Serato DJ VS Traktor Pro 2 - Should I buy Serato DJ? Maybe you're a DJ that likes to use controllers? Or maybe you like to use turntables and CD decks and long for the traditional set-up with digital capabilities. Whichever type of DJing you enjoy most Serato DJ could be just what you're looking for. We've gone over just a small amount of it's stand out features and you can see that the power of this software is phenomenal. Providing a clean and simple to use interface makes it great for beginners wanting to incorporate a DVS into their set-up. Experienced DJ's and turtablists will enjoy it's full digital features, easy music library access, and endless possibilities as a DVS. 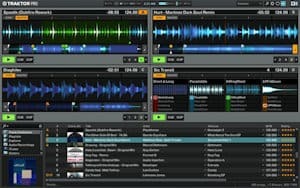 Is Native Instruments Traktor Pro 2 the best DJ software? 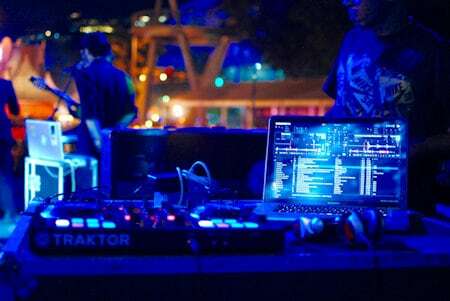 Native Instruments Traktor Pro 2 is another program used by many professional DJ's. Just look at their website and you'll see some of the testimonials from the likes of Pete Tong, Dusky, and more. Traktor Pro 2 is tried, tested and proven as one of the best performing programs available . Just like Serato DJ this program can be used as a DVS using encoded vinyl or CD's to create that traditional DJing experience. It plays a wide range of file formats including all of the popular ones like MP3, WAV, AIFF, and FLAC files. But as a note for Windows users, it's unable to play Apple Lossless (ALAC) files on windows 7 or 8. So if you wish to play these files you'll need to upgrade to Windows 10. That's not really a deal breaker though as Windows 7 and 8 are pretty much obsolete now anyway. Again this software could be used perfectly by beginners as they progress. It's also perfect for experienced DJ's looking to further enhance their set-up, and digital DJing capabilities. The first thing worth mentioning is that Traktor Pro 2 can work in conjunction with the original Traktor. If you've used the previous version of Traktor, this software can be installed and used alongside it. This means any previously saved cue points, loops etc, will transfer to the new program. A great feature that saves you running back through each track to re-create any saved information. Serato DJ VS Traktor Pro 2, the interface. When you open up Traktor Pro 2 you'll find a nice interface layout on a dark background. 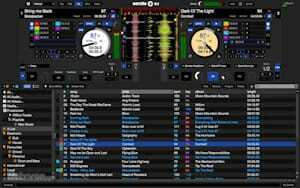 This is not dissimilar to Serato DJs interface but you'll definitely have your favorite. Initially it may look a little messy and cluttered compared to Serato DJ. But you can clean this up by choosing different layouts to customise it to your liking. When you click the layouts tab you'll have a choice of 4 layouts. Each layout offers different options and each will have their advantages. First off you have your Essential layout. This is a simple 2 deck uncluttered layout. This would be the choice for beginners or anyone using the software for the first time. Next you have the Extended layout which gives you even more features and extra FX options. You have a handy Browser layout that gives you a full view of your music library. This makes it easier to find and select the track you are looking for. If you're in a rush to find a track, just hit your space bar to enter full browser layout. And lastly you have a Mixer layout that gives you an on screen mixer. This is used for internal mixing if you don't have hands on equipment. Each layout is customizable in the preferences tab where you can change the decks and mixer layout to your liking. And you'll also have global settings, browser details, and layout manager tabs for customization. These tabs can be used to adjust your interface and create new layouts. This way you can get the look and specific options/features you want. This is a good way for beginners to make the interface less overwhelming. They can then add certain features and options as they progress. At the top of the screen on the left and right you'll find your FX options for each channel. This can be found when using the standard extended layout. You can change these to a single effect. This lets you select any effect but you can only add one per track at a time. Or you can select a group of up to three. This gives you the ability to use a total of 6 different effects at once. You will find a long list of effects to play around with including filters, delays, etc. They are all listed in a handy drop down menu so you can easily scan through to find the one you want. You'll also have an on/off button and three knobs to adjust the parameters of each one. Sometimes you can customise the hell out of an effect and think, I wish I could use that again for next time. But as soon as you turn your laptop off it's gone... Well, Native instruments realised this and gave us a really cool option. Once you have a customised effect you like and wish to use again you can hit the snapshot button. This lets you save your settings and easily return to it in the future. How cool is that? In the deck section you'll be able to drag and drop tracks to easily play your selection. In each deck window you'll find up to nine pieces of information associated with the track information. These include all the usual things like the track name, track length, time elapsed, etc..
You will see a close up view of the waveform and an overview of the whole track. Here you can change the waveform colours to your preference. You can even use colour coded waveforms to show the different frequencies in tracks. An example of this would be all bass sounds in the waveform being red, high hats being blue, and breakdowns being white. For the easy option you'll also have a sync button option to auto beatmatch. This works exceptionally and can be adjusted to tempo sync or beat sync. Tempo sync just matches the tempo and BPM of the tracks. This gives more of a natural DJing experience as theBPM can vary especially if tracks have been ripped from vinyl. So you will have to use your ears and occasionally nudge the beat. The other option is beat sync that works in conjunction with the phase meter. This will keep the two tracks locked in beat and any nudging or scratching will jump straight back into alignment. Here in the deck section you can also add beat grids and edit with the grid edit panel. You can also use beat jumps just like we spoke about in Serato DJ. And you can add cue points to store up to 8 hot cues. You can also add and save auto loops which you can then adjust in real time from 1/32 to 32 beats. And as you're creating and adjusting the loop it auto syncs to your selected track to keep everything in time. The sync phase feature will also keep everything in time so that when you exit a loop it auto realigns the tracks. You can change the view of the deck window by selecting to edit the deck flavour in preferences. The options include micro, which shrinks the deck to give you more space. Small, which makes it bigger and adds more options. Essential, which gives you the biggest waveform available. Full, which includes all of the previously mentioned deck section options. And advanced which opens up extra panels. Below the decks you can add a sample deck option which is an awesome new feature for Traktor. Here you can drag and drop samples from your computer which auto sync to the track you are playing. Or you can create loops in real time then drag and drop the loops to the sample deck to add filters and effects. These sample decks can also be controlled by using a midi controller like the Traktor kontrol x1 or s4. Trakto Pro 2 also comes with a massive bank of FX. In this version of the software there have been some really cool additions. These include bouncer, ramp delay, and tape delay. The effects bank could make for endless FX combinations and really add something different to your mix. Unfortunately VST's aren't supported but given the amount of available FX, you should never get bored. If you like the idea of using special external hardware a new feature to Traktor Pro 2 is the new stem deck. You can pair Traktor Pro 2 with a compatible midi controller. You will then be able to play and adjust a special multi track file known as a stem file. These files display a four section waveform on your external controller and play a music track that has been split into four musical sections. For example you could have a track split into bassline stem, drum stem, melody stem, and vocal stem. You can then control each stem individually and get very creative with your mixing. You can then mix these stems between decks. So you could take the bassline of one track and mix it with the beat of another. Stem decks could create a world of new opportunities and allow you to create live mashups, remixes, acapellas, and more. The Traktor Pro 2 music library is very simple but has a lot of useful features. You'll see your track collection with different column options. Here you can display whatever you like using the drop-down menu. You can chose from column options like cover art, BPM, genre, artist, comments. Or special features like a rating system, play count, track time, and lots more. If you like the idea of harmonic mixing the track key is something that could come in very handy. This can be displayed in a library column to show you the key your track is recorded in. This is totally ignored by many DJ's but it will make a massive difference to your mixes. You'll be surprised how much better a mix will sound when it's mixed in key! You'll also have an auto sort option in the library, this is for arranging tracks by genre, artist, etc. And you get a preparation window to get your tracks ready to play in your set. Over on the left you can search your library for a specific track. You will also be able to create playlists and organise your music folders here. And just like the rest of the interface you can add or remove options. This lets you keep it as minimal as you like depending on what you want to see. The Traktor Pro 2 DVS works just like Seratos DVS using encoded vinyl or CDs. To use Traktor Pro 2 as a DVS you will need to buy the Traktor scratch add on. You'll also need a supported sound card. The Traktor Scratch A6 comes with everything you need. This includes the full package to set up the Traktor Scratch DVS hardware. You'll get a sound card, a pair of encoded control CD's, and a pair of encoded control vinyl (mk2). And you'll receive a serial number for the hardware and software, a pair of RCA cables, a power cable, and hot key map sheet. So with this option you'll have all you need to get going with the Traktor DVS. Native instruments offer a range of special controllers, instruments, and effects machines. These offer the possibility to get even more creative, combing the software with a hands on approach. 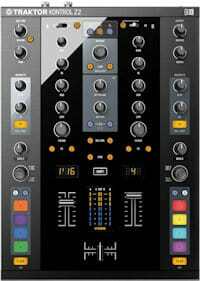 Or maybe the fully loaded Traktor Kontrol S4 MK2 DJ Controller. This is the high end controller and will even play the earlier mentioned stem files. This mixer also comes with the full Traktor Pro 2 software. For those interested in the DVS, Native instruments even do mixer bundles. These bundles come with the mixer and the full Traktor Pro 2 software. You also get control CD's and vinyl that all work seamlessly together as a DVS. One of these amazing bundles is the Traktor Kontrol Z2 mixer. And thanks to the simple plug and play USB port it's easy to connect additional hardware. If you like effects and loops this could be paired with the Traktor Pro 2 Kontrol X1. Or if you like messing with stems this could be paired with the Traktor Kontrol F1. Feature packed software that will transform your DJ sets. Easy to adjust the interface to suit individual requirements. Easy to use, great for beginners or experienced DJs. A top choice of many pro DJ's. Tried, tested, and proven DJ software. Great for DJ's and turntablists, excellent DVS capabilities and not laggy. Compatible with lots of hardware. Many special controllers and hardware available to help you get really creative. Gives you the ability to mix internally without hardware. Software may have the odd bug, but updates / bug fixes can be expected. Should I buy Traktor Pro 2? If you're a DJ that enjoys digital DJing with the ability to use special plug and play hardware alongside a DVS, this could be the one. The difference between this and Serato DJ is really minimal. But with the addition of the vast array of special hardware that is available, this could really open up new possibilities for you. If you're a beginner DJ, Traktor Pro 2 will really grow with you. You can add features as you progress. And you can get creative by expanding your set-up as you move forward as a digital DJ. If you're an experienced DJ you can add special hardware to expand your set-up and learn new skills. You can really get creative with things like stems which can transform your mixes. Using Traktor Pro 2's many excellent features your DJing skills will continue to grow for many years. Serato DJ VS Traktor Pro 2 - Decision time! The battle of Serato DJ VS Traktor Pro 2 continues! But which one is going to win a place alongside your set-up? We've taken a look at the main stand out features. You now have a great comparison between the two programs. Whichever one you go for will bring you hours of fun and will really expand your options as a DJ. Let me know which one you chose and what specific function did it for you. Once you have the software you'll need a good set of headphones. Check out the best options on the market > HERE. Check out some awesome DJ controllers > HERE. Or if you've decided Serato and Traktor aren't for you, check out the awesome Rekordbox controller that I'm currently using > HERE. Pingback: Pioneer PLX 1000 VS Technics SL 1210 - Which is the best DJ turntable? Very informative. It’s made my choice a lot easier thank you ?